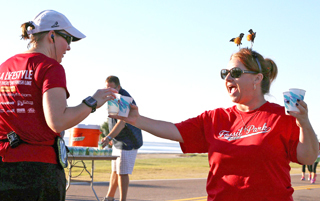 In an effort to give back to our community, we invite small groups to adopt an aid station during each of our races. Any non-profit group of eight or more volunteers will receive a post-race donation of $200. Minimum age is 12. Run-oriented groups will receive comp entries for upcoming races. This is a fun way for running clubs, youth athletic teams, school groups, and other charities to participate in our community events while earning funds for your organization. “Just a short note to say how much I enjoyed the run yesterday. Thanks for all your hard work. I always try to spare enough air to say “thank you” to the volunteers I see along the way. Without them, none of this would be possible. Thanks a million again!